Offered here is an autographed on-site programme from Floyd Mayweather Jr v Oscar De La Hoya in May 2007. 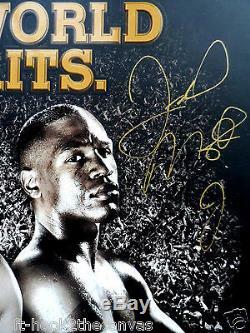 The front cover has been neatly signed in gold pen by Mayweather. Six-division world champion De La Hoya (38-4, 30 KO) met undefeated four-division champ Mayweather (37-0, 24 KO) in a hotly anticipated super-fight billed'The World Awaits'. Mayweather won by split decision, capturing the WBC light middleweight title. The program is in very good condition. There's light wear to the top and bottom of the spine. This is one of the thickest boxing programmes out there, more like a small book than a program! Please check out our other boxing memorabilia! The item "2007 FLOYD MAYWEATHER v OSCAR DE LA HOYA programme signed by Mayweather with LOA" is in sale since Monday, May 16, 2016. This item is in the category "Sports Memorabilia\Boxing Memorabilia\Autographs". The seller is "london_collectibles_limited" and is located in Chessington. This item can be shipped worldwide.